Well without any doubt, iPhone 7 Plus is a great phablet that comes with the amazing specs and features that the previous flagships of Apple lacks. 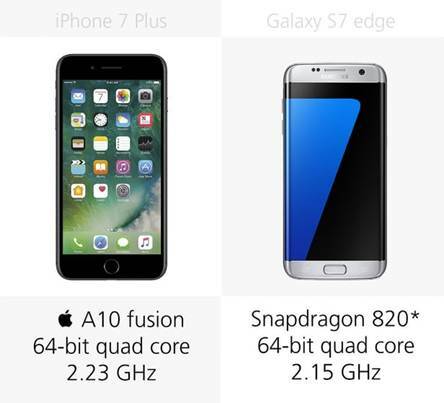 At the same time, Galaxy S7 Edge can overweigh the features of iPhone 7 Plus with its amazing specs and premium offerings. But among these both phones, iPhone 7 Plus and Samsung Galaxy 7 Edge, which one’s better? If you are looking to find the answer to this question, then you are at the right place. Here I am going to compare both these phones, with one spec at a time, so that you can make your decision wisely. 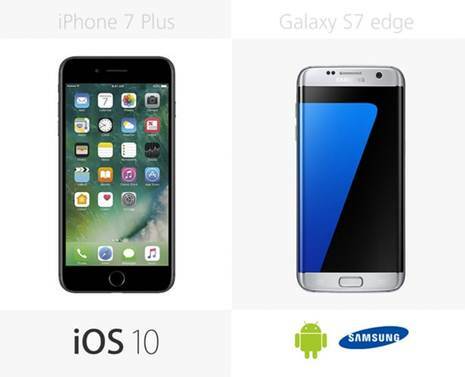 Samsung’s Galaxy S7 Edge and Apple’s 7 Plus smartphones are the amazing examples of revolutionary trendsetters in the tech market. So, how do they up against each other on paper? Size matters, either you are looking for your phone, or for your car, size is always a matter of concern for the buyer. 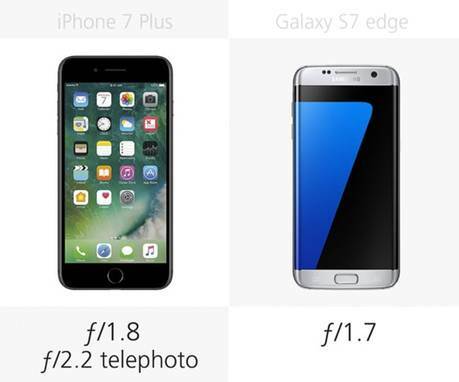 So, in this regards, as iPhone 7 plus is a phablet, it is naturally 5 percent taller than the S7 Edge with the length of 158mm. not only this, with the width of 78mm, it is wider and slimmer too, with the thickness of only 7.3mm. 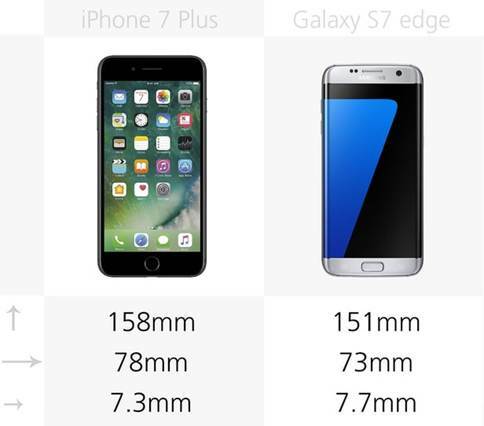 while Samsung Galaxy S7 Edge has got the length of 151 mm, width of 73mm and thickness of 7.7mm. So, when it comes for size, iPhone 7 Plus got a point. Now the next feature that I am going to compare between the two phones is their weight. As a matter of fact, the lightest, the better. The iPhone 7 plus being the taller and denser phone weigh 188 g, while the galaxy S7 Edge weighs only about 157g. A difference of 31 gram is considerably notable, when it comes to looking for a lightest phone. Samsung S7 Edge won the crown for being the lightest phone among the two. Hats off to the designers of both the phones and both have got something innovative in their own way. 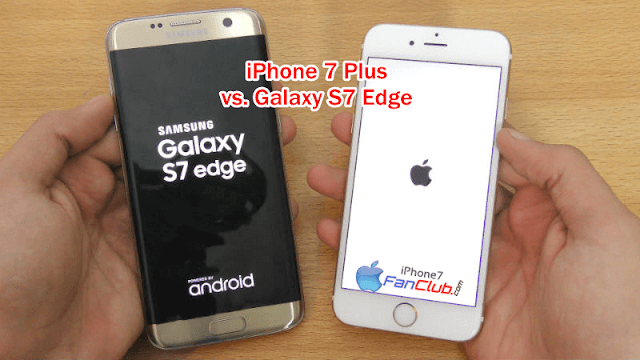 Samsung joyously innovate the Galaxy S7 Edge with the curved screen, while iPhone 7 Plus has got the blueprint of its predecessor. Not only this, the Galaxy has got the IP68 certification for water resistance, while Apple has got IP67. This means, Edge can survive in 1.5m of water as compared to Plus’s 1m. on the other hand, both the phones stick to the same display size of 5.5”. Despite being heavier, iPhone 7 Plus has got the same display size as that of S7 Edge. The reason behind the fact is that the extra header and footer space is being used for camera, speakers and home button hardware. Meanwhile, the Edge has got higher screen to surface size ratio. So, when it comes to design, Samsung S7 Edge tops the list. iOS 10 is made available to all Apple devices, but this OS was specifically designed by keeping in mind, the iPhone 7. The glimpse of this OS shows that it is much better and classier than the previous version of iOS that adds a plus for iPhone 7. On the other hand, the Samsung S7 Edge comes with that updated version of 6.0 Marshmallow, which just add an extra layer of functionality to the typical android experience. So, clearly, this time, Apple’s got a plus. Performance is another matter of concern when it comes to smartphones. The Apple’s new flagship is equipped with formidable A10 fusion chip, that offers almost 40 percent improvements in the speed when compared to A9. Not only this, its GPU is 50 percent more efficient than its previous version. Contrary to this, the processor of Samsung is determined by its territory, as Europe usually gets an Exynos while US gets a Snapdragon 820. Again, Apple’s iPhone 7 Plus gets a point. So, the headline for the time is that iPhone 7 Plus has got the dual lens camera, that combines the impressive wide angle 28mm lens. There is also a quad-LED flash with the front 7 MP camera, that makes the pictures clearer and sharper. With that tough competition, it is a good point for Samsung Galaxy S7 Edge to have that same 12 MP rear camera, but it still doesn’t matches those dual lenses camera. Moreover, the camera focuses quickly and packs loads of details. The camera aperture of f/1.7 means that it performs well in low light. iPhone 7 Plus got another point. It is good to see such a great competition among these two phones that matches each other almost in each term of specifications. However, in most of the specs, iPhone 7 Plus has got maximum points, while Galaxy’s design is impressive. Regarding all these facts, iPhone 7 Plus has certainly won the competition this time! Next story iPhone 7 Plus vs. Google Pixel XL – Which One Is Better? Previous story Why To Buy iPhone 7 Plus as Galaxy Note 7 Alternative?